As I glanced around and then back at this particular stranger’s sad face, my second instinct was to say something to her, despite my first instinct. With a gloved hand, she removed her earbuds and covered her mouth in a sudden, soft sob, looking up at me with glassy eyes. “Thank you. Yes. Thank you. Thank you. I’m okay,” she said. I had burst her protective bubble of silent, solitary sadness, but she seemed genuinely grateful. “Yes. Thank you. Thank you.” As she nodded, the tears rolled down her cheeks, painting Rorschach drips of mascara across pink skin. That teenage boy continued bobbing to his bass, and that old woman continued reading her romance novel, and still, nobody else spoke. “Thank you,” she said again, as we exited the train together. “You’re welcome. Can I do anything to help you?” I walked next to her along the platform. She told me she was headed to a friend’s house. She said “thank you” at least three more times. “Thank you. Thank you.” She half-grinned and half-grimaced through glimmered eyes and wobbled off ahead of me while I followed at a delicate distance. On the stairs, she turned around, almost tripping on herself, to say “thank you” one more time. Shonda Rhimes makes the same argument. During the “year of yes” that she wrote about in her best-selling book (and spoke about at the recent TED2016 Conference), she found that simply saying “yes” to trying things that scared her was enough to make those things lose their scariness. I’ve been musing on this idea a lot lately. We think that we’re afraid of what might happen after we act, like it’s the uncontrollable, unpredictable result that’s scary — and it is. But we’re equally scared of ourselves. We’re half-afraid that we won’t be able to handle whatever happens, while half-afraid that we just won’t want to handle it, because it might be unpleasant or uncomfortable or exhausting. But once we choose to engage, we give ourselves the agency that proves we’re capable of tackling any sort of uncontrollable aftermath. The actual aftermath stops mattering so much, because we wind up with the sense of control we were craving in the first place, plus an added dose of empowerment. When everyone on that train ignored that crying stranger, it was because of fear. It was the kind of fear that presents itself as prideful insistence on doing the proper thing. It was an indirect decision in favor of inaction and disengagement. It was everyone choosing apathy like an air bubble; like the balloon of an inflated ego; like a shiny bell jar of social normalcy and supposed manners. I felt that fear, however silly and subtle, when I reached out to ask the question: the tinge of nerves, the wavering insecurity, the timidity. Maybe she wanted to be left alone. Maybe I would embarrass her by drawing attention to her private pain. I didn’t have the slightest clue what upset her — whether her boss had been especially strict that day, or she had just lost her significant other of several years, or she was simply tired. I didn’t know what gears were turning inside her head, what nerve was pinched in her heart. And did I want to know? Was I prepared to accept whatever wild answer she might give me? To burst both of our bubbles and to allow her ache to eke into my tiny atmosphere? It’s always scary to open oneself up to other human beings. By acknowledging the tricky tenderness of other people’s feelings, we are forced to acknowledge the tricky tenderness of our own. 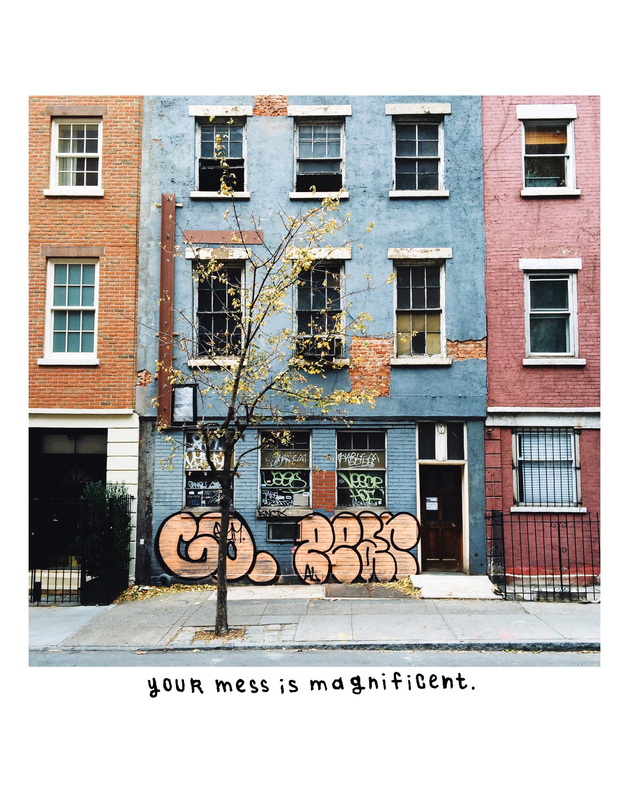 We are reminded that life is messy, and oftentimes, it stings. We are all just hurtling through this thing, careening against currents we can’t control. We want to minimize the jolts and the bounces and the bruises. Apathy is easier. That way, when things don’t turn out the way we like — well, we weren’t invested anyway. Our bubbles soften the blow, and when the bubbles burst, there’s someone or something else to blame. But in the moment on the train, I wasn’t thinking through the reasoning. All that I registered was an instinct to recoil, followed by an urge to unfurl myself from that instinct — from that restrictive, reductive, residual habit of human biology that prefers predictable ease over openness and beauty and bravery and hope. Elizabeth Gilbert says that fear warrants respect. It’s a natural human tendency that is necessary for survival. We need fear just as much as we need food and water and shelter. We need it to remind us not to cross the street when cars are coming; not to irresponsibly spend our savings on unlikely bets; not to swim out too close to sharks. But we don’t need it during the creative process, or before big presentations at work, or in interactions with strangers on the subway. We don’t need it when we’re not actually in danger. The important thing, she says, is not to deny our fear or attack it or battle against it, but to work with it and around it. In moments when there is, in fact, nothing objectively hazardous happening, she suggests kindly thanking the fear for showing up, as if it’s a human presence, before sweetly shooing it away. In those scary but ultimately harmless scenarios, when we’re not protecting our lives, we’re protecting our senses of belonging. Arguably, psychologically, the need to connect with other human beings is just as important as the need for food and water and shelter, and it’s just as fundamental as the craving for control and predictability. We don’t want to do the wrong thing, to be embarrassed, to be ridiculed or shunned. We don’t want to seem weird or stupid. We want to be seen and heard and accepted and understood and loved. And so, ironically, we isolate ourselves to avoid isolation. We dissociate, convincing ourselves it’s the key to integration. Is it possible to strengthen the instinct for companionship and camaraderie, building it bigger than the instinct for easy predictability? Can compassionate connection become the urge that comes first? The story we tend to tell ourselves is often one of rugged individualism and stubborn strength, like that in Wild. It’s one in which crying is a quiet, shameful act unintended for public spaces; in which we’re supposed to handle our pain on our own; in which confident control trumps compassionate emotion. But most of us aren’t trekking on rugged, solitary hikes. We’re riding crowded trains, hurtling through darkness at rapid rates, surrounded by strangers. Maybe we’d feel safer if we loosened that one-handed grip on the shiny silver rail and instead sought balance in the people who are jostling along beside us; if we disconnected from our headphones and earbuds and connected through eye contact; if we realized that supporting each other might actually be as easy as “are you okay?” and “thank you.” Bursting our own bubbles might actually feel good. Maybe we have to rewrite the story — one in which belonging is plentiful, camaraderie is powerful, and we’re here to handle the hard stuff together. And maybe we have to prove that story into reality by making it true with our own actions. Maybe that’s the wiser way to get the control we crave. P.S. Pass it on: send this post to someone who needs it, or sign up for the email list to have Core Stories delivered straight to your inbox for easy forwarding purposes.